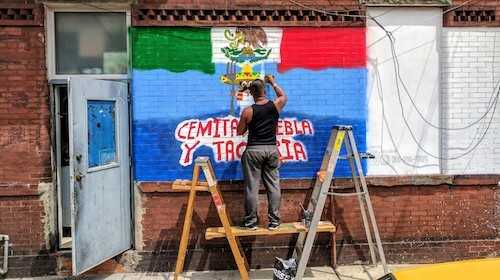 On an extended walk through Hudson County, NJ a few months ago, the first impression of Cemitas Puebla Y Taqueria was immediately wanting to eat a sandwich here, the famous cemita, a torta from Puebla. 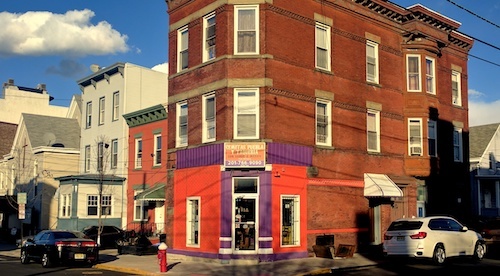 The restaurant occupies a corner building of a somewhat slow intersection, a colorful facade and sign hinting at what lives within the brick walls. When the chance finally came for that sandwich to be eaten, opening the door to this establishment turned out to be a revelation. As it swung open, it was like hearing holy sounds come from above. The interior takes the entire floor of the building, much larger than it seems from first glance. What I mistook for a small sandwich counter was actually a full-fledged Pueblan restaurant and taqueria. 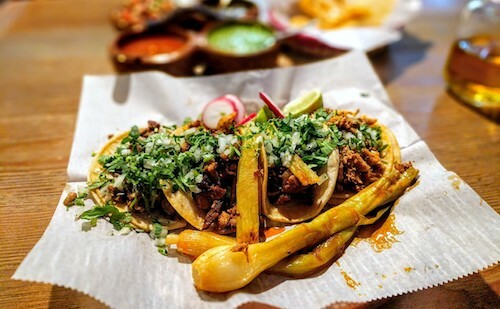 I thought the "taqueria" was just a nominal addition to the restaurant's name, but the steaming cauldron of taco meat options inside and al pastor trompo immediately proved me wrong. One chef seemed to be in charge of all the ingredients pertaining to tacos, and was taking his job very seriously. 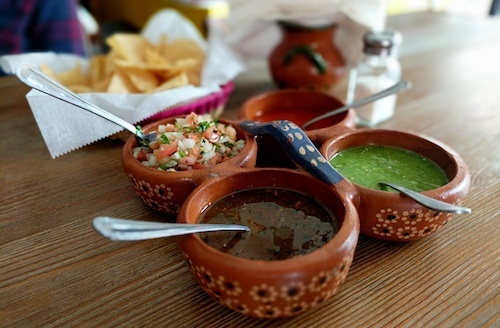 No matter how large or small your order, the beautiful four part ceramic salsa holder above is brought to your table with a basket of tortilla chips. From the salsa roja at the top and continuing clockwise, the spice levels drop from high to medium to mild. The pico de gallo is not hot at all, but still very fresh and good. The chips are fine, and easily made tasty with these delicious homemade salsas, but they beg to be used for greater purposes and wait for the cemitas to arrive. A glass of their homemade agua de jamaica ($2, above) is recommended to wash everything down, not as sweet as some and very refreshing. 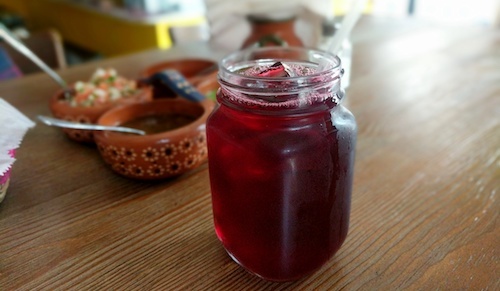 This purple/magenta drink gets its color from hibiscus and is a popular drink throughout México. Often the versions found in Brooklyn and Queens can seem too sweet and are probably not homemade, but this one is just right. 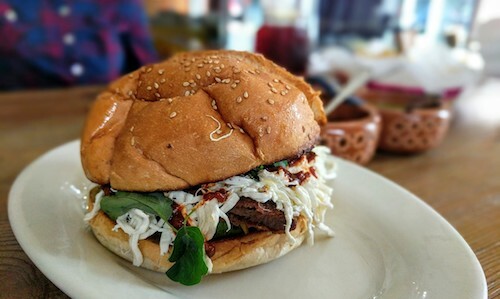 When the beautiful cemita de bistec empanizado ($8.50, below) arrives, jaws immediately drop to the table surface. A cemita gets its name from the bread roll it is served on, and the sesame-crusted roll they use here scores 10 out of 10. 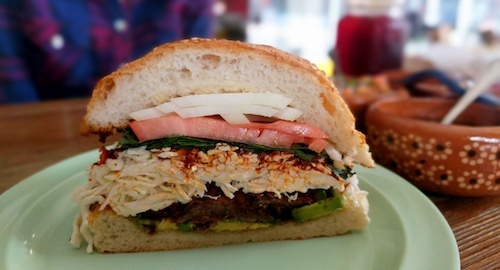 The ingredients of a cemita, shown in section view below, are somewhat different between the bun as well. The deep-fried meats might be found in any old torta, but the use of the leafy herb pápalo creates a unique taste. This restaurant uses a wonderful chipotle salsa underneath it all, with thin slices of avocado accenting the mountain of white Oaxacan cheese. If there were a calendar made with photos of cemitas, this one would be January. 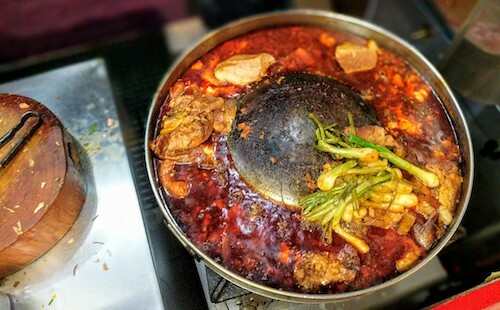 That bubbling cauldron of meats that caught the eye a few months back is put to good use, as all sections of the pig and others are cooked and marinated to perfection. You see this type of setup at almost any reputable taco shop in Mexico City, but unfortunately it is quite rare here in New Jersey and New York City. On the menu, these are listed as Tacos - Mexico City style ($8 for 4, below), and as promised come out looking very true to their name. Of course, as is the norm, the tortillas come out of a package, but the meats truly shine here. The tripe (tripa) shines brighter than most tacos on the east coast, while the pastor are delicious but unfortunately just past their prime as the trompo does not spin with orders as fast as it wants to. The hunks of pineapple and house made salsas make up for some of this. Regardless of how good the food is here, the vibe is also very warm and festive with smiles and fun music. Mexican blankets used as window treatments seem to dictate the wall paint colors and general design scheme. An overall care of environment was even visible outside, where a new wall mural was being painted towards the back.